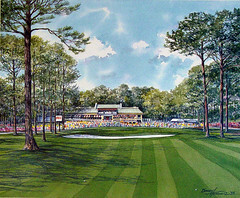 Description: "The 9th Hole" is a offset lithograph by Barry Honowitz painted at the 1995 MCI Classic on the Harbour Town Golf Links in the Sea Pines Resort. The image is 12.5" x 10" and the paper is 18.75" x 16". A limited edition of 1500, signed and numbered by the artist.